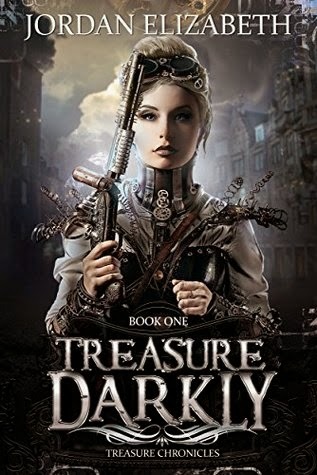 S.A. Larsen, Award-winning author of middle grade & young adult fiction: Wistful YA~TREASURE DARKLY by Jordan Elizabeth & a GIVEAWAY! Wistful YA~TREASURE DARKLY by Jordan Elizabeth & a GIVEAWAY! My next featured young adult tale is from a sweet author, who happens to be one of my co-authors filling up the pages of GEARS OF BRASS. She writes down her nightmares to live her dreams, as quoted from her CQ bio. How cool???? Intrigued by a touch of steampunk, mystery, and romance all wound up in a western setting? Then check out this next YA release. And remember to enter for your chance to win one of two free eCopies of the book! Favorite Line/ Passage: Amethyst: Adam tossed Amethyst onto a sack of grain behind a closed barrel. Breath whooshed from her lungs as her body jerked against the hardness. The gag slipped down her lips enough for her to spit it out. "You idiot," she panted. The only light in the cellar came from the doors to the outside that Adam had left open. "You don't think someone's going to find me in the bloody cellar?" (Kindle: 53%) OMGosh, I just love this character. I'd like to thank the author for supplying me with an eCopy in exchange for an honest review. Description: Seventeen-year-old Clark Treasure assumes the drink he stole off the captain is absinthe… until the chemicals in the liquid give him the ability to awaken the dead. When Clark brings her back to life, however, the real action starts, and Amethyst joins him in his fight against the Horan clan—whatever the cost. Defeating the Horans may seem easy at first, but going up against men with the same fighting vengeance as Clark, and a Senator with power he’s obtained by brainwashing the masses? Well, Amethyst’s boring summer at home has turned into an adventure on the run, chock full of intrigue, danger, love, and a mysterious boy named Clark. My Splats: a little bit of snark and romance mingle with steampunk elements in a western flair to bring an under-privileged boy to his true lineage. Raw and real is what opens the first few scenes. The reader is introduced to a dank yet busy brothel and Clark as a child, exposed to truths of life at such a young age. He tends to take most of it in stride, accepting what he can't change and seeing hope for growth in what he can. It was actually refreshing to see a younger person claim his life instead of wading through as a victim. Despite living in a less-than-appropriate establishment for a child, Clark has an obvious affection for his mother, which is so nice to see in a young adult story. I was particularly intrigued by the overall premise. Being plagued with the ability to bring back the dead in exchange for another's life is quite the burden to bare. Complicate that with the accidental stealing of that gift/curse, and it makes for great tension and conflict. Speaking of conflict, the idea of a boy from nothing showing up at a wealthy home to claim he belongs to them ... I think you get the picture. And within that tension, there's loads of family member conflicts: some for Clark and some against him. Then add in a feud with a rival wealthy family, growth of commerce and dignity of different peoples, and that the government is searching for the one who stole the potion to begin with, and you'll have to agree that Clark's journey is full of action. Spoiler Alert: And then there's the paranormal aspects of Clark discovering his real father and communicating with his spirit... I'm such a sucker for any otherworldly trait. I'd recommend this story for any action-packed/romance, YA enthusiast, and also anyone who appreciates the finery of the western and Victorian eras. The giveaway runs from 05/27 to 06/10. The two winners will be drawn after that an announced the following week. Thanks so much for entering and spreading the word! Seems really intriguing, thanks for sharing! Yeah, Marcy. I really think this story is up your alley. Love that cover, and the review is fantastic. Congratulations to Jordan! P.S. I tried to tweet the giveaway from the message provided in the Rafflecopter, but Twitter won't allow it saying it's automated. I've never had that problem before. I'm curious as to whether anyone else is having that same problem. That cover is awesome! She looks so cool. It does sound very intriguing. Congratulations to Jordan! This sounds like a fun read, and I love the cover! I enjoyed Jordan's stories in the anthology. She's a great writer. Thanks for sharing this. Congrats, Jordan! Sounds very exciting. Ooo, snark. Can not resist. Congrats Jordan! Steampunk gals are wicked! I love them. Steampunk makes for such gorgeous reads! This one has a tremendous premise :) Great review! Steampunk always makes for a fun and interesting read - especially with some added snark! Congrats, Jordan!